Description: Malta Crest offers a rich luxurious look. A medallion styled backplate is adorned with two Amber faux candlelights with elegant Gilded Tobacco finished candleholders. 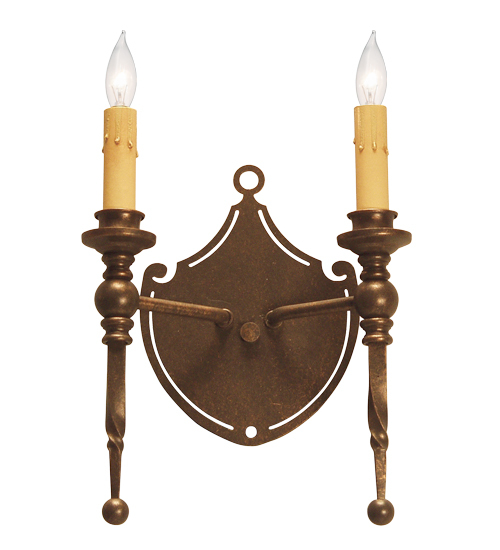 This high-styled wall fixture features decorative accents in a matching finish. This ADA Compliant sconce is ideal to complement a variety of architectural styles for today's interiors. Handcrafted by highly skilled artisans in our 180,000 square foot manufacturing facility in Yorkville, New York. Available in a wide range of custom choices including various finishes and sizes. UL and cUL listed for dry and damp locations.